"Would definitely recommend you to my friends/family!!" "Dr. Esposito and the staff are amazing!!" "I would and have recommended them to anyone looking for outstanding medical care." "Very professional! Dr Esposito is awesome!!" "Very caring, I would highly recommend Milford Vascular Institute!" "Love you all like you are part of my family. Truly the best!" Milford Vascular Institute’s Outpatient Based Laboratory (OBL), located at Diagnostic Imaging of Milford, recently received the Gold Standard in Accreditation for outpatient surgical care facilities, as awarded by the AAAASF. The AAAASF Accreditation is a seal of approval patients can count on. We graciously accept this award as a testament to our commitment to quality patient care. 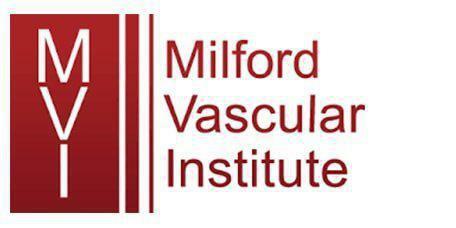 The Milford Vascular Institute is located between Bridgeport and New Haven Connecticut, provides multidisciplinary care for all aspects of vascular disease. By taking advantage of the different areas of expertise and skill sets of both an interventional radiologist and vascular surgeon, MVI offers comprehensive, state-of-the-art therapies including radiofrequency treatments, dialysis, and laser treatments for conditions including varicose and spider veins, leg swelling, and other vascular diseases. The initial consultation, diagnostic tests, and definitive treatments are all coordinated and performed through one office, and we believe that this streamlined approach offers the patient the most efficient and thorough care with a much higher likelihood of successful outcome. The on-site vascular laboratory provides immediate diagnostic input and allows for close, long-term surveillance. The physicians are trained and skilled in vascular diagnostics and imaging and all the latest vascular therapeutic techniques, ranging from minimally invasive office procedures to complex endovascular and open surgical repairs. Our vascular surgeons are easily accessible and provide continuing educational support throughout the entire healing process. We believe that this model of patient care provides a level of service that is unmatched anywhere in southern Connecticut. Milford Vascular is now offering the The VenaSeal™ closure system as an option for treating varicose veins. Our greatest asset is our staff. We believe that each of us needs a sense of dignity, pride, and satisfaction in what we do. We believe that each patient should be treated with respect and compassion. Because the health and well-being of our patients depend on the united efforts of many, we are most effective when we work together cooperatively, respecting each other’s contribution and importance. We demonstrate our beliefs most meaningfully in the way we treat each other and by the example, we set for one another. Through service and educational initiatives, we demonstrate our values to the community in which we live. In all our interactions with our patients and their family members, vendors, referring physicians and staffs, we seek to deal with others as we would have them deal with us. Use our Online Vein Screening tool to submit information about your areas of concern to a member of our team. Once we've received your submission, we will get back to you within 72 hours to discuss next steps! "I started to have varicose vein problems. I was self conscious and had leg pain. I'm happy to say this summer I'm wearing shorts again for the first time in years." "Can't ask for a better place to treat my veins." "All the staff are the most kind and compassionate caregivers I've met in a long time."